Welcome to Day 6 of your crash course on down and dirty welding metallurgy. Titanium and titanium alloys are used where light weight is a big factor as in aircraft and aerospace industries, for golf club heads, for certain corrosion resistant applications, and for human medical implants. Titanium is very corrosion resistant to certain corrosives like chlorine, and salts and therefore is used in processing of bleach, and for salt water applications. The cost of Titanium came down with all the changes that have happened in Russia. That along with the fact that more and more people are understanding that titanium welding metallurgy is not that hard, has allowed for titanium to be used in all kinds of applications where the cost was once prohibitive. The two most commonly welded titanium and titanium alloys are commercially pure titanium and 6AL4V which is alloyed with aluminum and vanadium. Here comes the broken record again: Remember on day one when I talked about how metals harden? And that carbon and low alloy steels, cast iron, and some 400 series stainless steels harden by heating and then quick cooling? And that practically every other metal actually got softer by heating and then quick cooling? And that you needed to understand that before going any further? Well it is day 6 of the course now and we are talking about titanium alloys and titanium welding metallurgy (down and dirty that is). Are you getting it? If you are, then you already could guess the answer to this question: If I heat a titanium alloy red hot and then drop it in a bucket of ice water, will it harden? Well, what’s the answer? Have you been paying attention? The answer is …….NOPE But this time the answer is not quite that simple,,, just heating the titanium to red hot without shielding the metal from the atmosphere can cause it to get harder. What happens is this: oxygen, hydrogen, and nitrogen from the air will actually be absorbed into the metal and cause it to become hard and brittle. But it is not the heating and quick cooling that does it… it is just the fact that the red hot titanium was exposed to air and it absorbed the elements from the air into the metal making it hard and brittle. Now thats Down and Dirty Titanium welding metallurgy! So that’s the big challenge in welding titanium and in understanding titanium welding metallurgy. Keeping all the areas that become molten, completely shielded from the air and also keeping areas that reach around 1000F shielded from the air. Simply put, if all areas of the weld are shiny silver with little or no discoloration, then you know it was properly protected. Oversized nozzles or trailing shields are used to protect the welded side and any reverse side of what is being welded is protected by either purging the entire side with argon, or by using special purge boxes or backup boxes that provide diffused argon gas to a local area. Failure to shield hot areas results in something called alpha case. Simply put, alpha case is like a case hardening where the surface is harder than the core. This is a common cause for failed welds. Cleanliness is another important factor when welding titanium. It needs to be completely clean and free from oil, grease, paint or anything else. Acetone is the best solvent to use. Stay away from canned degreasers because they can contain chlorinated solvents that are really bad for titanium. Remnants of chlorinated solvents will be absorbed into the titanium microstructure when heated. 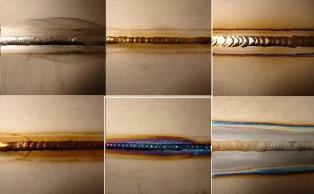 That causes welding metallurgy term called "stress corrosion cracking". The absolute worse thing you can do when welding titanium is to use the wrong rod. When I say wrong rod , I don’t mean wrong titanium rod. I mean accidentally picking up a stainless or nickel rod and welding with it. This is easy to do if you don’t keep the work area free from all other rods because titanium rods and stainless rods look similar. If you accidentally weld with a stainless or nickel rod , you are pretty much screwed. The weld will be as brittle as glass and will crack even before it completely cools.You will actually hear the tink...tink,,,,tink of the titanium cracking moments after and even during welding. You will then have to remove every last bit of the weld material that was contaminated in order to proceed. On aircraft parts, the part might just have transformed from a 100,000 dollar part into a worthless piece of scrap metal. That’s a hard pill to swallow so the more you know about down and dirty titanium metallurgy, the better.